North Arrow Minerals is one of three Resource Opportunities sponsors and Lucara Diamond and North Arrow are portfolio companies. Canada punches above its weight in the world of diamonds – way above. Consider: the country is home to about 36 million people, or less than half of one percent of the world’s population. 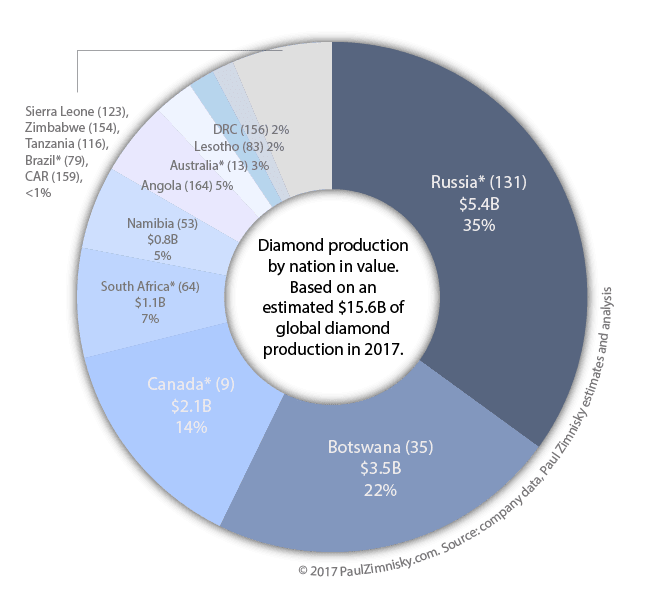 Yet in 2017, Canada produced 14% of the world’s diamonds by value, behind only Russia and Botswana. The epicenter of Canadian diamond production lies in the frozen tundra of Canada’s North – the “Barren Lands,” in author Kevin Krajick’s words. Specifically, the Lac de Gras region, 300 kilometres northeast of Yellowknife, the Northwest Territories’ capital city. That’s where prospectors Chuck Fipke and Stu Blusson discovered the kimberlite indicator minerals that let to Dia Met’s 1991 diamond discovery. When Ekati went into production in 1998, it marked the birth of what has become an important northern industry. The discovery of the Diavik diamond mine by Gren Thomas’s Aber Resources in 1994 established that the Ekati find was no fluke. Diavik went into production in 2003 and quickly became one of the world’s richest diamond mines. The discovery of diamonds in this inhospitable corner of the world, surrounded by only frozen lakes and tundra, is a testament to the ingenuity and perseverance of Canada’s diamond pioneers. Two decades later, the Ekati and Diavik diamond mines are still churning out carats – and cash. More than $20 billion worth of diamonds has been mined at the two operations. The prized profit centers didn’t escape the notice of the Washington Group, a private conglomerate founded by US billionaire Dennis Washington. Last year the Washington Group paid about US$1.2 billion to snap up Dominion Diamond Corp., owner of a controlling 90% interest in Ekati and a 40% stake in Diavik (operator Rio Tinto owns 60%). Aerial photo of the Diavik diamond mine, 60% owned by operator Rio Tinto and 40% owned by Dominion Diamonds. And the Lac de Gras region remains a hub of activity for diamond production and exploration, well beyond Ekati and Diavik. 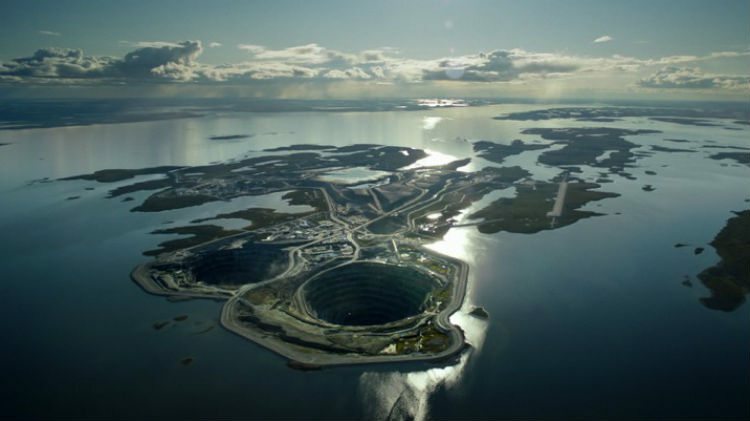 The newest mine is Gahcho Kue, which began commercial production in March 2017 and is 51% owned by De Beers and 49% by Mountain Province Diamonds (MPV-T). North Arrow Minerals (NAR-V), Canada’s most active diamond exploreco, is also zeroing in on Lac de Gras. The company has two projects in the region and both of them will see drilling this spring. The Loki project covers 8,600 hectares and is close to both Ekati (33 km away) and Diavik (24 km). North Arrow will drill about 1,000 metres on up to six targets in March. Loki is a good example of a junior company benefiting from millions of dollars spent by a major while big money flowed into exploration. One of the six Loki targets is EG05, a diamondiferous kimberlite that Rio Tinto (Kennecott) discovered but never followed up on. The other targets were identified through airborne geophysics and electromagnetic surveys. At each target, pyrope garnets and other kimberlite indicator minerals have been recovered, but no source has been found. At Dominion’s Lac de Gras (LDG) joint venture with North Arrow, operator Dominion is ramping up for 2018 exploration, including spring drilling. Dominion has an approximate 67% interest in LDG, with North Arrow retaining 33%. The LDG JV covers a vast 125,000-hectare property to the south of the Ekati and Diavik mines and immediately east of Loki. The “privatization” of Dominion Diamond Corp. translates into fewer eyes on the company, particularly its exploration initiatives. But Patrick Evans, Dominion’s CEO – appointed after the takeover – is well-known in the diamond world. Evans is the former president and CEO of both producer Mountain Province Diamonds (MPV-T) and explorer Kennady Diamonds (which was recently taken over by Mountain Province for $176 million). Evans’ exploration background – and his assertion that new diamond discoveries are critical to the viability of the Canadian diamond industry – will likely ensure that exploration remains a key focus for Dominion. In a 2016 talk at the annual Roundup Mineral Exploration conference in Vancouver, Evans lamented the “paltry” amount being spent on diamond exploration in Canada. The dearth of exploration threatens Canada’s No. 3 position as a world diamond player, Evans said at the time. Loki and the LDG joint venture represent North Arrow’s most imminent potential catalysts. But North Arrow continues to advance its flagship Naujaat coloured diamond project in Nunavut, which has a population of rare, valuable fancy yellow diamonds. On Wednesday the company announced it had recovered 64.25 carats from a 209.8-tonne mini bulk sample collected last year from three phases of the large Q1-4 kimberlite. 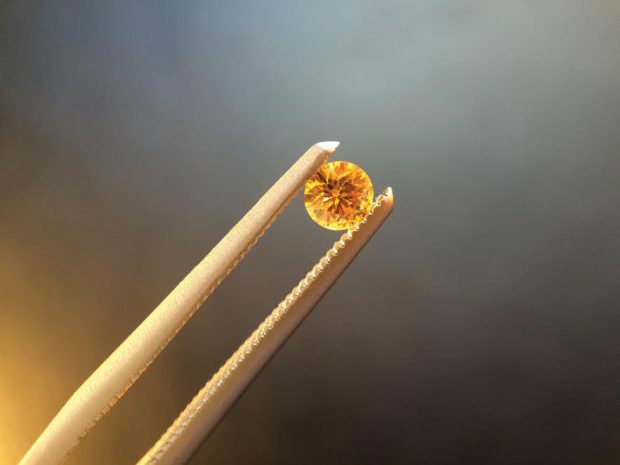 The proportion of the more valuable yellow diamonds was consistent with an earlier bulk sample – 10.7% of the total by stone count and 21.2% by carat weight. The next step, Armstrong says, is a large bulk sample at Naujaat – perhaps as large as 5,000 to 10,000 tonnes. A sample of that size would answer remaining questions about the value of the diamonds and size-frequency distribution of the yellow stones, he said. It would also carry a large price tag: perhaps between $20 million and $30 million. Securing a joint venture partner would allow North Arrow to undertake the bulk sample without blowing out the share structure, Armstrong pointed out. Fancy yellows and orangey-yellow diamonds from an earlier sample at North Arrow’s Naujaat. The diamond sector has faced some ups and downs in recent years, but mostly downs. One of the main issues has been large inventories held by industry heavyweights Alrosa and De Beers, which has suppressed rough diamond prices. There have been some high-profile scandals in the sector, too – Indian diamond magnate Nirav Modi fled India earlier this year and is currently being investigated for alleged bank fraud and money laundering. However, the macro picture is improving, according to New York diamond analyst Paul Zimnisky. Inventory levels for both De Beers and Alrosa are at estimated three-year lows and demand remains healthy, according to Zimnisky’s latest State of the Diamond Market report. On the supply side, no new mines are coming onstream in 2018 and Alrosa’s production is forecast to decrease this year. For a sector that has struggled – and been bypassed by many retail investors – there’s a lot going on. The takeover of Dominion Diamond by a private group was a surprise to many; less so the purchase of Kennady Diamonds by Mountain Province, which had earlier spun out the exploreco. There are new and rejuvenated exploration plays, including Bruce Counts’s newly listed Lithoquest Diamonds (LDI-V) with its North Kimberley project in Australia. In the Northwest Territories, GGL Resources (GGL-V) has revamped with the appointment of 25-year diamond veteran David Kelsch as CEO and an injection of capital from project generator Strategic Metals. But for diamond sector investors, perhaps the most interesting moves were made by Lucara Diamond Corp. (LUC-T) on February 25. 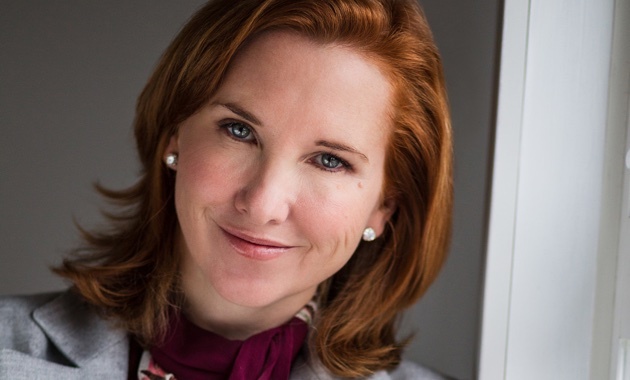 Diamond veteran Eira Thomas was named Lucara’s CEO and the Vancouver-based company announced a blockchain initiative that could improve transparency and efficiencies in the sale of diamonds in the one to 15-carat range, and eventually for smaller stones as well. Blockchain will not be used to sell the larger diamonds that have established Lucara’s reputation and bolstered its treasury – stones such as the 1,109-carat Lesedi La Rona and 813-carat Constellation. Eira’s most recent CEO gig was with Kaminak Gold, which was sold for $520 million to Goldcorp in 2016. Before that, Eira – the daughter of North Arrow chairman Gren Thomas – cofounded Stornoway Diamond Corp. (SWY-T) and Lucara. Her partner on both initiatives was Catherine McLeod-Seltzer, who is joining Lucara’s board of directors. The appointments mark a kind of reunion for Lucara’s three co-founders – Thomas, McLeod-Seltzer and Lukas Lundin. But before Stornoway, Lucara or Kaminak was Aber Resources. Hired as an Aber field geologist straight out of university, Eira was thrust into a lead role when a senior geologist left for another company. In the spring of 1994, the geologist and her exploration team raced the spring melt and drilled one final hole from a floating ice platform. The core had a 2-carat diamond embedded in it, and the rest is history. She later became VP Exploration for Aber, Dominion Diamond’s predecessor company. 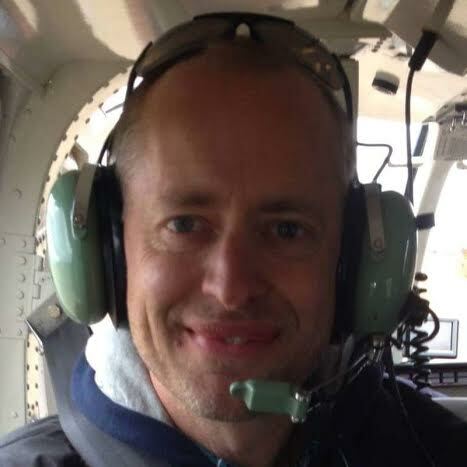 Eira’s appointment as Lucara CEO strengthens already solid connections between Lucara and North Arrow. She remains a North Arrow advisor and large shareholder, and was critical in landing $2-million investments from both Ross Beaty and the Electrum Strategic Opportunities Fund L.P., which is funding North Arrow’s current programs. There’s a brother connection between the two companies, too – North Arrow CEO Ken Armstrong’s brother John is Lucara’s vice-president, mineral resources. His specialty is the assessment and analysis of diamond size and value distribution as well as deposit modelling. John Armstrong’s partner Allison Rippin Armstrong, a corporate social responsibility specialist, is an advisor to North Arrow. As for Eira, her association to North Arrow’s flagship Naujaat project runs deep. It was Thomas who secured the Naujaat project (formerly called Qilalugaq) from Stornoway Diamonds and brought it to North Arrow, after stepping down as Stornoway’s executive chairman. The Naujaat, Pikoo and Timiskaming projects were optioned from Stornoway on a JV basis, with North Arrow subsequently buying out Stornoway’s stakes to secure 100% interests in Naujaat and Pikoo. 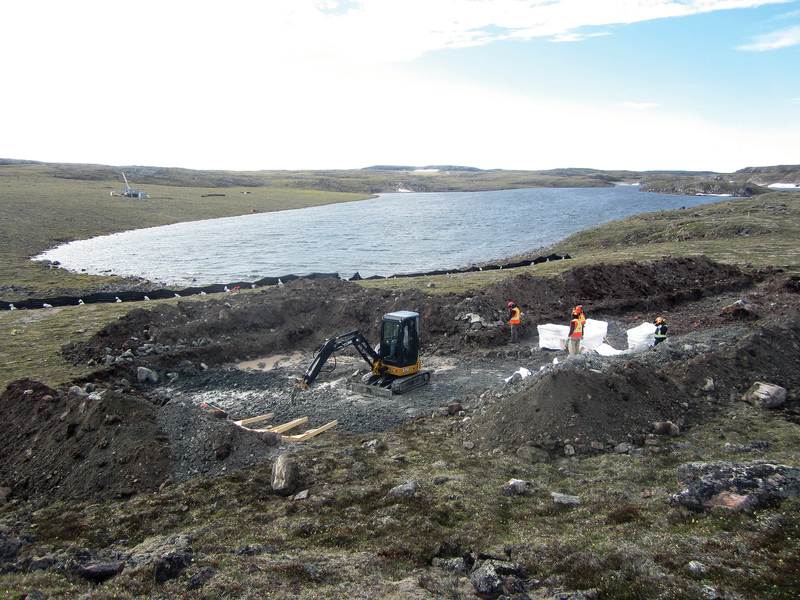 Collecting the mini-bulk sample at North Arrow’s Naujaat project in Nunavut. Assays are pending for 2,440 metres of kimberlite core drilled at Naujaat last fall. Further drilling later this spring will conclude the program at the 12.5-hectare kimberlite, the largest in the Eastern Arctic. Naujaat has an Inferred mineral resource of 26.1 million carats from 48.8 million tonnes grading 53.6 carats per hundred tonnes, from surface to 205 metres depth. Fall drilling established that Q1-4 remains open at depth and has a surface area of at least five hectares 305 metres below surface. Further north, there are also drill plans at Mel, North Arrow’s second grassroots discovery of a diamondiferous kimberlite field in Canada (Pikoo was the first). In October, North Arrow announced the recovery of 23 diamonds larger than the .106-mm sieve size from a 62.1-kilogram sample at the ML-8 kimberlite. The diamond body was discovered through the systematic tracking of a kimberlite indicator mineral (KIM) train to its up-ice termination. North Arrow has subsequently increased its Mel land position to 56,000 hectares through staking. Driling will focus on ML-8 as well as other targets at the heads of three well-defined KIM trains. Disclosure: North Arrow Minerals is one of three company sponsors of Resource Opportunities and James Kwantes owns North Arrow and Lucara shares, which makes him biased. Readers are advised that this article is solely for information purposes. Readers are encouraged to always conduct their own research and due diligence, and/or obtain professional investment advice. Dollar and $ refer to Canadian dollars, unless otherwise stated. North Arrow Minerals is one of three Resource Opportunities sponsors. The November 1991 discovery of diamonds in the Northwest Territories by Chuck Fipke and Stu Blusson put Canada on the global diamond map. It also triggered one of the largest staking rushes in the world, as hundreds of companies hurried north to find treasure. A few years later, many had retreated to warmer climes. One company that remained in the hunt was Gren Thomas’s Aber Resources, with a large land package staked by Thomas and partners at Lac de Gras near the Fipke find. In the spring of 1994, an Aber exploration crew led by Thomas’s geologist daughter, Eira Thomas, raced the spring melt to drill through the ice in search of kimberlite — the rock that sometimes hosts valuable diamonds. It was a longshot. Since the Fipke find, the great Canadian diamond hunt had virtually ground to a halt — despite the millions of dollars spent in search of the glittery stones. But the drill core from that final spring hole had a two-carat diamond embedded in it. The Diavik discovery meant it was game on for Aber — and Canada’s nascent diamond industry. A quarter century after that fateful hole was punched through melting ice, Canada punches above its weight in the world of diamonds. Measured by value, the country is the third largest producer of diamonds by value globally. And the valuable diamonds that continue to be unearthed at the Diavik mine discovered by Aber are a big reason why. The discovery unleashed a wave of shareholder value. The shares of Aber and its successor companies went from pennies to more than $50 as the quality of the diamonds and the asset became known. Dominion Diamond Corp., as Aber is now known and which owns the Ekati mine and 40% of Diavik, is Canada’s premiere diamond company. Diavik is expected to produce about 7.4 million carats this year, making it among the world’s largest diamond operations. The team behind the Diavik discovery has also created a fair amount of shareholder value in the years since, led by Eira Thomas. She has co-founded two diamond players, Stornoway Diamond Corp. and Lucara Diamond Corp., and remains a director of the latter Lundin Group company. Her most recent gig, as CEO of Kaminak Gold, ended rather well — Goldcorp bought the company for $520 million last year. Thomas is also an advisor to North Arrow Minerals (NAR-V), a cashed-up junior company at the forefront of Canadian diamond exploration. Aber’s Gren Thomas is North Arrow’s chairman and the CEO is Ken Armstrong, a former Aber and Rio Tinto geologist. North Arrow recently raised $5 million to explore its portfolio of projects and a drill program is underway at its advanced-stage Naujaat project, which hosts a population of valuable fancy orangey yellow diamonds. In a space with few new discoveries or development projects, Canada is home to two of the world’s new diamond mines. Stornoway’s Renard mine in Quebec and Gahcho Kue, a De Beers-Mountain Province joint venture in the Northwest Territories, have both recently begun commercial production. Globally, the diamond industry has faced headwinds, including India’s demonetization and choppy rough stone prices. But diamonds remain a money maker for some of the world’s largest mining companies, including Rio Tinto (60% owner of Diavik) and Anglo American. Incoming Rio boss Jean-Sebastien Jacques identified diamonds as a “priority area” last year in a Bloomberg interview: “I would love to have more diamonds, to be very explicit.” The company recently backed up those words by signing a three-year, $18.5-million option on Shore Gold’s Star-Orion South diamond project in northern Saskatchewan. And Anglo’s De Beers division remains a reliable profit generator. In 2016, rough diamond sales surged for both Anglo American (up 36%) and Russian producer Alrosa (up 26%), according to The Diamond Loupe. A recent hostile takeover bid for Dominion Diamond reflects the demand for well-run diamond mines, which are powerful profit machines. The picture is less promising on the exploration front. Budgets dried up during the mining slump that began in 2011, and little grassroots exploration work is being done. It’s particularly problematic for supply because diamond mines take longer to discover, evaluate and build pharm. The new Canadian mines will help fill the gap, but it won’t be enough. Economic diamond discoveries have simply not kept pace with mine depletion, globally. The looming supply deficit is particularly acute for rare coloured diamonds, which fetch higher prices. Australia’s Ellendale mine produced an estimated 50% of the world’s fancy yellow diamonds before closing in 2015. The Argyle mine, also in Australia, is one of the world’s biggest mines and a source of valuable coloured diamonds, including extremely rare pinks. It, too, is slated to close in the coming years, after decades of production. North Arrow’s Naujaat could help fill the void. The project hosts a population of fancy orangey yellow diamonds that are more valuable because of their rarity. Naujaat is on tidewater, which dramatically reduces costs, and hosts a very large diamondiferous kimberlite, Q1-4, that outcrops on surface. It’s the focus of this year’s $3.2-million program, which will see North Arrow drill 4,500 metres and collect a 200-tonne mini bulk sample. The goal is to extend the Inferred resource to a depth of at least 300 kilometres below surface and better define the diamond population. The sample will be shipped south in late August and processed in the fall. In 2014 and 2015, North Arrow collected a small bulk sample at Naujaat (formerly known as Qilalugaq) with the goal of gauging diamond values. But the carat values on the small 384-carat package came in significantly below expectations. North Arrow shares were relegated to the market penalty box and the company has been largely under the radar since, despite important background work that set the stage for this year’s program. Contrarian investing and the ability to time cycles can lead to fortunes in the junior mining sector. Vancouver investor Ross Beaty has proven it, time and again. In the early 2000s, with copper trading for under US$1 a pound, his team assembled a portfolio of unwanted copper assets in a bear market. He developed and sold those projects during bull markets, turning $170 million in invested capital into shareholder returns of $1.87 billion. His latest win was a large bear-market investment in Kaminak Gold, later bought out by Goldcorp. Beaty’s latest contrarian bet is on North Arrow, through a $2-million investment that was part of the recent $5-million private placement financing. Other investors included the New York-based Electrum Strategic Opportunities Fund ($2 million) and company management and directors. The money will fund an aggressive program at Naujaat including drilling and a bulk sample, as well as exploration at North Arrow’s Mel, Loki and Pikoo projects. 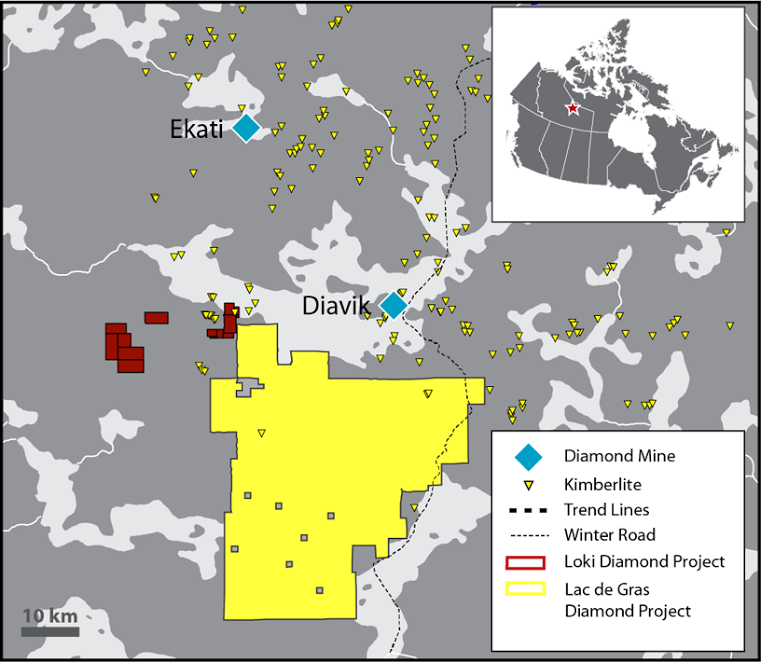 North Arrow also has exposure to drilling through the LDG (Lac de Gras) joint venture with Dominion Diamond Corp. That project borders on the mineral leases where Diavik is located. Ekati is 40 kilometres to the northwest. Dominion plans to drill several targets later this summer as part of a $2.8-million exploration program. North Arrow will have a 30% interest in the JV. With a target on its back, Dominion is highly motivated to enhance shareholder value. And that extends beyond mine operations to exploration and new discoveries. In May, Dominion announced a “renewed strategic focus on exploration” and a $50-million, five-year exploration budget. As for Naujaat, North Arrow is revisiting the project after a polishing exercise yielded fancy yellow diamonds that turned some heads in the industry. Several were certified “fancy vivid” diamonds, a coveted designation in the coloured diamond world. The quality of the polished stones suggests the fancy orangey yellow diamonds at Naujaat are considerably more valuable than the June 2015 valuation of the roughs indicated. The primary conclusion of the diamond evaluators was that the 384-carat parcel of Naujaat diamonds was too small to properly evaluate. North Arrow plans to remedy that, in part, by collecting a 200-tonne bulk sample that should yield another 80 to 100 carats. The sample will be taken from the kimberlite’s highest-grade zone, A61. Lab results are expected in early 2018. Another complicating factor at Naujaat is the presence of two distinct diamond populations of different ages, including a population of rare fancy yellow diamonds. It’s a consideration that was not factored into the prior carat valuation. It will be next time. Diamonds are a rarity play, and diamonds that occur less frequently — such as coloured diamonds and large diamonds — are more valuable. Yellow diamonds made up only 9% of the 2015 Naujaat sample by stone count, but more than 21% by carat weight. The drilling at Naujaat is targeting kimberlite between 200 and 300 metres in order to bring material designated target for future exploration (TFFE) into the Inferred category. That drilling, plus the mini bulk sample, should help North Arrow better evaluate the diamond deposit on the path to a future Preliminary Economic Assessment. The Q1-4 kimberlite has a horseshoe shape that makes it amenable to open-pit mining and a low strip ratio. A larger bulk sample is planned for 2018. 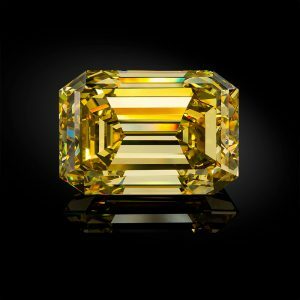 Fancy yellow diamonds were thrust into the spotlight earlier this month when Dominion unveiled the striking 30.54-carat Arctic Sun, a fancy vivid yellow diamond cut from a 65.93-carat stone unearthed at Ekati. Dominion also played up coloured diamonds in their latest corporate presentation — specifically, the sweetener effect of high-value fancy yellow and orange diamonds at Misery. The potential emergence of Canadian coloured diamonds could help solidify Canada’s position on the world diamond stage, according to analyst Zimnisky. On the branding and marketing side, Canadian diamonds continue to have strong appeal because of their high quality and ethical sourcing. And the two recent Canadian mine openings are a bright spot for the global industry, despite early growing pains at both Gahcho Kue (lower-than-expected values) and Renard (breakage), he pointed out. “There is absolutely an opportunity to sell Canadian diamonds at a premium, especially in North America,” Zimnisky said. The United States remains the world’s largest diamond market, despite the growth in demand from China and India. Important hurdles remain before any mine is built at Naujaat, but the strength of North Arrow’s management team bodes well for success, according to Zimnisky. 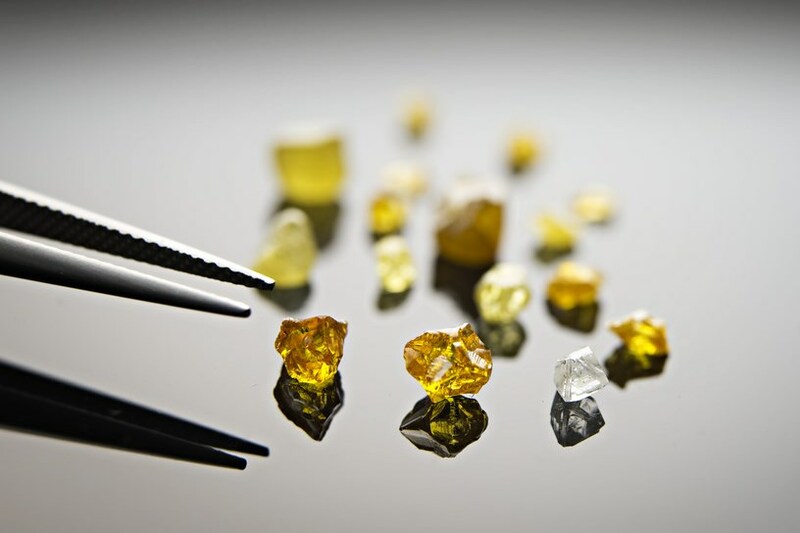 The appetite for fancy yellow and other coloured diamonds remains strong, despite the closure or pending closure of two of the mines that produce many of them. Last year a De Beers store opened on Madison Avenue in New York, Zimnisky said, and the feature diamond on opening day was a very large fancy yellow of more than 100 carats. Further north of Naujaat on Nunavut’s Melville Peninsula is another North Arrow project with a good shot at a kimberlite discovery. At the Mel property, 210 kilometres north of Naujaat, North Arrow geologists have narrowed down and defined three kimberlite indicator mineral (KIM) trains through systematic soil sampling over several seasons. Last year’s till sampling defined where the KIM train is cut off, suggesting the bedrock kimberlite source is nearby. The discovery of a new kimberlite field this season is possible, since kimberlites in the region outcrop at surface. “It’s a first look, but there’s potential for discovery without drilling,” says CEO Ken Armstrong. As for the Lac de Gras joint venture, the US$1.1-billion hostile takeover bid for Dominion unveiled by the private Washington Corp. earlier this year may work in North Arrow’s favour. In addition to spurring a stock surge, the bid forced the diamond miner to crystallize its focus on creating shareholder value. And a key strategy for Dominion, with its two aging mines, is a renewed exploration push. Finding new diamondiferous kimberlites in proximity to its existing operations would be a big boost for Dominion. One of its best shots is through the joint venture with North Arrow, which covers 147,200 hectares south of Ekati and Diavik. Dominion is spending $2.8 million on the project this season, including a planned drill program in the fall. North Arrow is well-positioned to capture the value of any Dominion kimberlite discoveries made. 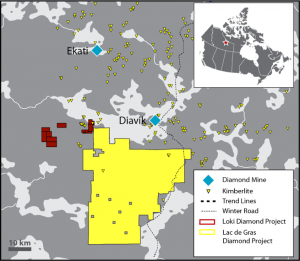 North Arrow also plans to drill two or three promising kimberlite targets at its nearby 100% owned Loki project, dovetailing with the completion of the LDG drilling. The company has received a $170,000 grant from the Northwest Territories government to drill Loki. North Arrow will also conduct till sampling in the fall at Pikoo, its Saskatchewan diamond discovery, in advance of a potential early 2018 drill program. Disclosure: Author owns shares of North Arrow Minerals. North Arrow is one of three company sponsors of Resource Opportunities, helping keep subscription prices low for the subscriber-supported newsletter. North Arrow Minerals is a high-risk junior exploration company. This article is for informational purposes only and all investors need to do their own research and due diligence. Subscribe to Resource Opportunities until July 15 and use COUPON CODE JUNE to receive US$100 off regular subscription prices of $299 for 1 year and $449 for 2 years. Our focus is actionable investment ideas with high speculative upside potential. Recent examples: $ERD.T at 37.5c & $SBB.T at 39c. Join today and profit!